In response to concerns raised, the CAMWS Executive Committee deliberated last week about the 2023 CAMWS Annual Meeting scheduled to take place in Provo, Utah at the invitation of Brigham Young University. After careful consideration, we stand by our decision to accept the invitation of BYU. 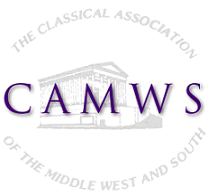 As is the case for all CAMWS Annual Meetings, the policies, procedures and programmatic decisions of the meeting are controlled by CAMWS rather than the host institution. Safeguarding academic freedom and ensuring a safe and inclusive environment for all are foundational principles of the organization (https://camws.org/codeofconduct). We do not believe that BYU’s policies will in any way infringe on CAMWS’s commitment to free speech and a safe and inclusive environment for all of our members, and we remain satisfied that these foundational principles will be respected. To that end, the Dean of the College of Humanities at BYU has confirmed to the Executive Committee that ‘in the context of on-campus academic meetings, it is [BYU’s] institutional policy both to respect and honor the academic freedom of all participants.’ We look forward to welcoming all of our members at the meeting in Provo in 2023.